For telephone craftwork. Connect wires to fuses and tighten nuts on binding post terminals. Place fuses in cable terminals. Double ended 3/8" and 7/16" hex sockets are color coded for quick identification of socket sizes. Design allows use of a wrench for additional torque. Manufactured from high carbon tool steel and heat treated for strength and durability. Sockets are feature thin wall design for access into tight spaces. Rugged high impact extruded plastic handle. Access telephone boxes and pedestals. Tighten nuts on binding post terminals. Use to insert and remove BNC connectors in digital video patch bays and high-density DSX cross connect systems. Machined from tool steel and heat treated. Durable handle made from resin. 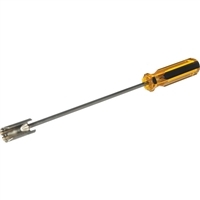 The Platinum Tools F Connector 8" Removal Tool is a dual function tool for use with coaxial F-connectors. A 7/16" hex socket on one end slides over your cable and rear of the connector for easy mating and un-mating of hard to grasp F-connectors. The other end features a 3/8-32 thread to provide a stable surface during cable preparation and insertion, eliminating the risk of injury from the center conductor. Hardened (RC55) CrV 8660 bits. Bits included: Slotted 2.0, 1.5, 1.2, 1.0, Phillips 0000, 000, 00, 0, Torx® 3, 4, 5, 6.
is the perfect tool for those cramped spaces. Features a 6 piece bit storage unit conveniently built directly into the handle, simply unscrew the top cap and swap bits out as needed. Also features a full ratcheting mechanism and a non-slip rubberized grip for quick tightening and loosening of screws with minimal effort. Designed and manufactured for the true Broadcast and Telco installation professional. Outperforms all other BNC Removal Tools in the market today, guaranteed! The barrel is precision machined from high strength tool steel and heat treated for long life. It will not stretch!! Extruded and polished resin handle. Made in the USA. Use to insert and remove BNC connectors in digital video patchbays. Use to insert and remove BNC connectors in high density DSX cross connect systems.